Scientists already proved that nicotine is not the killer, it's the harmful gases that comes out along with the nicotine burning, that kills a smoker and bringing lung borne diseases as cancer,heart failure etc. 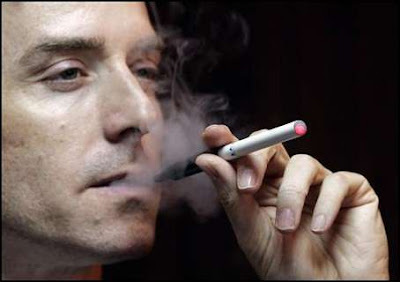 I personally don't know how addictive it is but with the way smoker wouldn't easily give up this habit, China has come up with an innovative yet not harmful technology, a gadget, a product called electronic Cigarette(battery operated) which mimics the real cigarette. It feels/looks like a cigarette, it even emits smoke and vapours, yet it's not bad for health but a way to help smoker quit their smoking habit. Price at NRs 14000($200) approx, i think it'll be an expensive deal for smokers. Aile tapailai hernu hai, maile jaaneko chu ni! Mero blog ni ramro sangale read gardaina ho! I had already written 27th June samma bhanera! hehehehhe! Anyways, I am a huge huge HUGE fan of Himesh Reshammiya, and his voice is amazing, and his Music too, mero laagi, but I can understand what you're saying as well! Well, Kaile bolne ho thachaina, but Soon I hope! Just got Exams starting from this week now! e-cigarate ma kata bata himesh reshammiya ayo?????? i wrote their i don't like Himesh but i didn't know she was her fan. umm..